This 10 by 12 foot greenhouse is home to our food production machine for tilapia, fresh veggies, and fruit. It is currently cycling ammonia in the system to establish bacteria among the rocks/clay media. I used lava rock for the bottom of the grow media and PlantIt for the top. 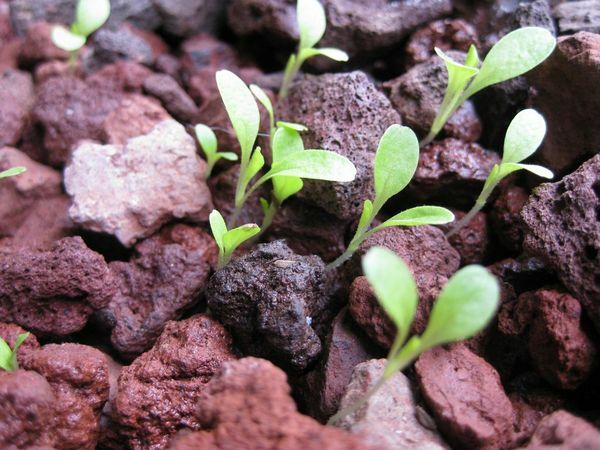 Lava rock is great as a grow media, but isn’t very easy on the hands. PlantIt is lightweight and a great product however it is expensive. Laying the two media types helped cut down on the costs. Fish waste water is pumped from a sump tank into the 3 grow beds where the bacteria converts it to nutrients that the plants can consume. The water is essentially filtered by the plants and drains back into the fish tank. Some of you may remember the Duckweed I started growing several months ago in preparation for this. The Duckweed will be fed to the tilapia as it reproduces faster than they can consume it. 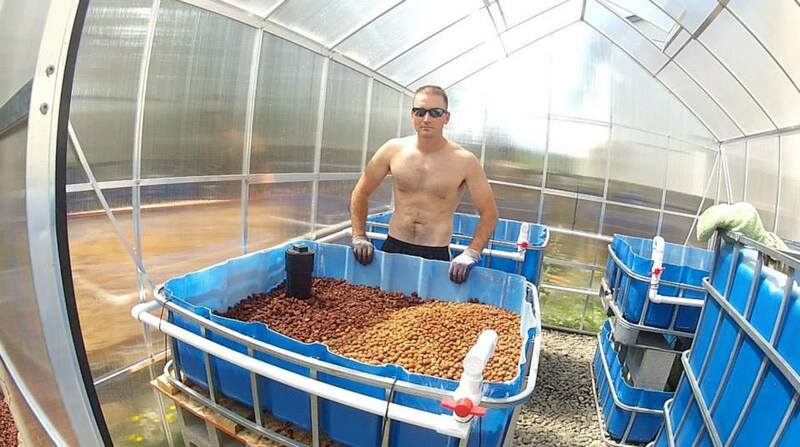 I would like to have a look at your aquaponics setup. 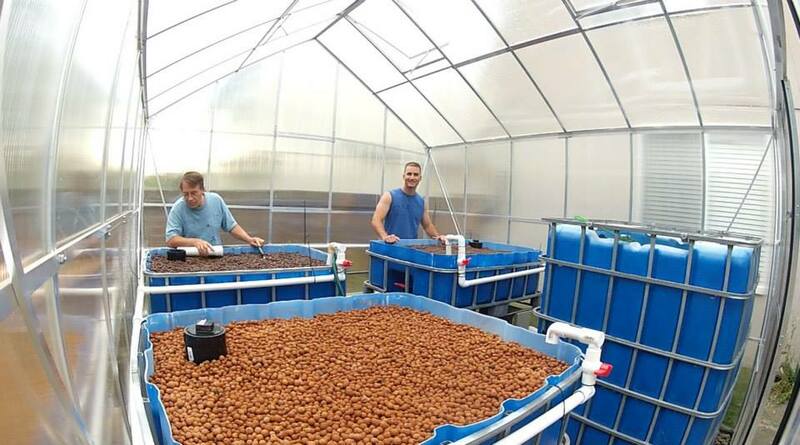 As a Master Gardener, i believe aquaponics fits in well with the goals of the program and I would like to set up a demonstration site at the Clark County Heritage Farm. Hello Phil thanks for your interest in the aquaponics setup. Currently I put a pause to the system while I work out a few kinks. The first issue is that the fish are too small for the system. This causes two issues, 1. They won’t produce enough fish waste and 2. They will get sucked through the plumbing. Sourcing the fish is a little expensive or else I’d just throw them in there awhile and see how it went. I’m also experimenting with heating the water for the tank. During the summer the water temperature was staying between 70 and 80 degrees which is perfect for the tilapia. Now that the weather has shifted though I’m averaging 59 degrees. This breed of tilapia is said to be able to survive down to 55 degrees but as you know the weather here isn’t even that cold yet. I recently joined the master gardener program myself in hopes that other people would be doing aquaponics as well. If you’d want to start up a system at the Heritage Farm I’d love to be part of it. I have books and DVD’s on the subject. Once we are back up and running I’d be happy to show you the system. I’m not sur how long it will tae to be back up and running… I’m a one man operation who occasionally gets a hand from my friends and family on projects so sometimes it gets a bit daunting researching everything myself. Majority of the people who do this live in Australia however the Urban Farming Guys (http://theurbanfarmingguys.com/) have a cool setup as does Growing Power (http://growingpower.org/) here in the U.S.
Craig, Thanks for getting back to me. Stephanie Potter, another master gardener, is also interested in getting started in aquaponics. I suppose you have considered other fish species. When we were in Texas there were catfish parlor s all over and the fish are delicious. Keep me informed. 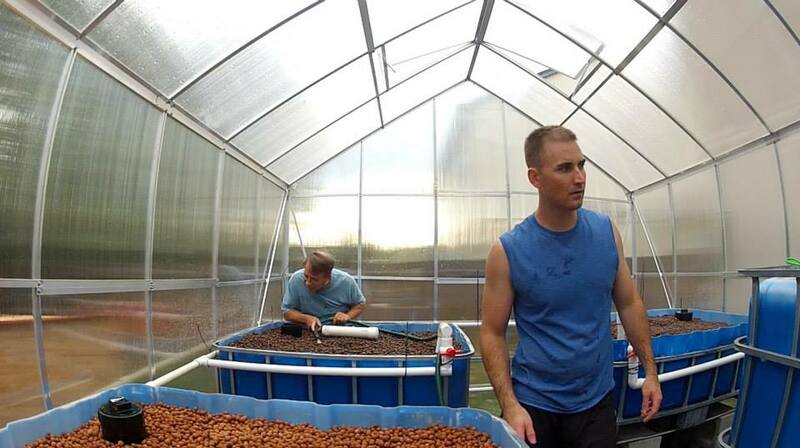 I am interested in your progress and am excited about learning more about aquaponics.